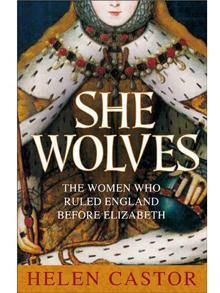 Helen Castor’s very readable “She-Wolves: The Women Who Ruled England Before Elizabeth” is, she writes, “the kind of book I loved to read before history became my profession as well as my pleasure.” It’s full of beautiful, imperiled ladies; fearless knights; and remarkable, often unbelievable turns of fortune. Pause a moment if you feel this topic is limited to the romance reader, or primarily to women. Castor’s story spans four centuries of English and European history, from the 1100s to the accession of Mary Tudor. The author is a fine scholar and an equally fine storyteller. Her chronicle contains many riches, offering insight into governance and power far beyond what its catchy title implies. Castor begins at the moment in 1553 when the adolescent king Edward VI, Henry VIII’s sole male heir, lay dying and the only remaining claimants to the throne were female. The first two Tudors, Henry VII and Henry VIII, had pruned their family tree of rivals — leaving only Edward’s sisters Mary and Elizabeth, and his cousin Lady Jane Grey.